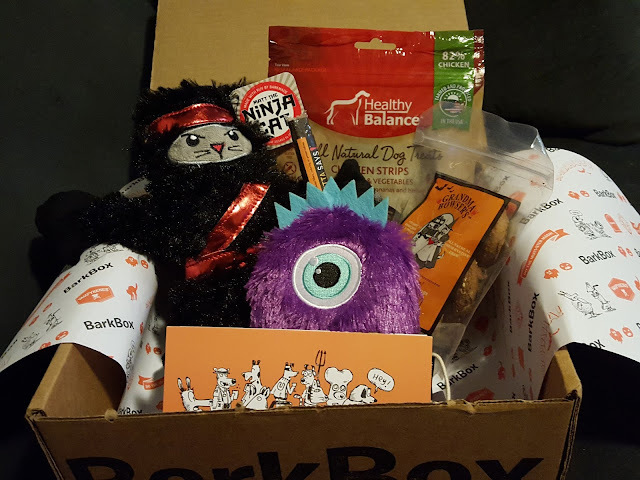 Pint-sized and Simple: BarkBox Review - October 2015 + Get A FREE Box! 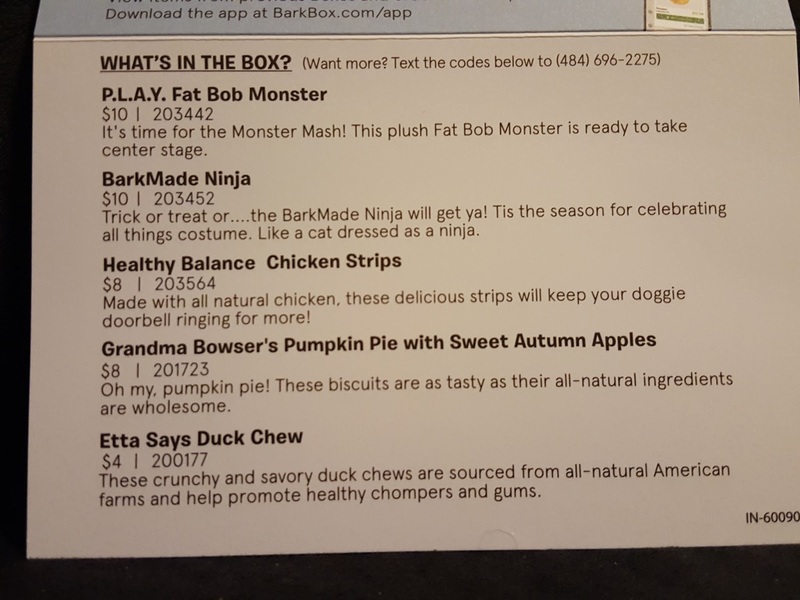 It was a no-brainer that October would be Howlloween month for Barkbox. In the past they've put out some stellar Halloween boxes (you can check out my reviews here and here) so I've got some pretty high expectations for this one. 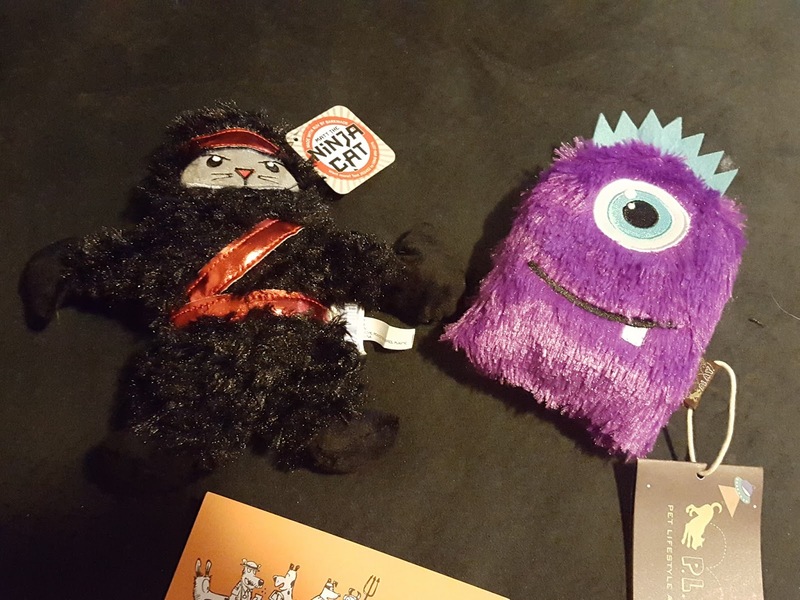 Let's find out what ghoulish surprises await the furballs! 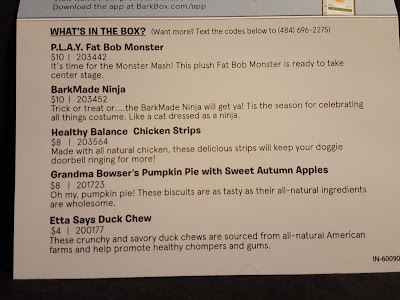 BarkMade Ninja (Value: $10) - Of course I'm going to start off with the toys. I'd say 4 out of 5 boxes have a Barkbox exclusive plush and although they're way adorable, I wish they'd include durable toys more often. Or offer a heavy chewers box. There's no way this ninja cat will survive longer than 30 minutes in my house. Grandma Bowser's Country Oven Biscuits - Pumpkin Pie with Sweet Autumn Apples (4oz value: $8 ??) - We've gotten Grandma Bowser's biscuits several times in our boxes and while the dogs do love 'em, I hardly think they're worth $8 for only 4oz (the Grandma Bowser's website sells 10oz bags for that price). I found out last year that my dogs like pumpkin so this will definitely be devoured within the next couple of weeks. Each bag has about 6-8 cookies and I don't recommend breaking them into smaller pieces because you'll end up with a crumbly mess. They're pretty hard to break apart anyway. 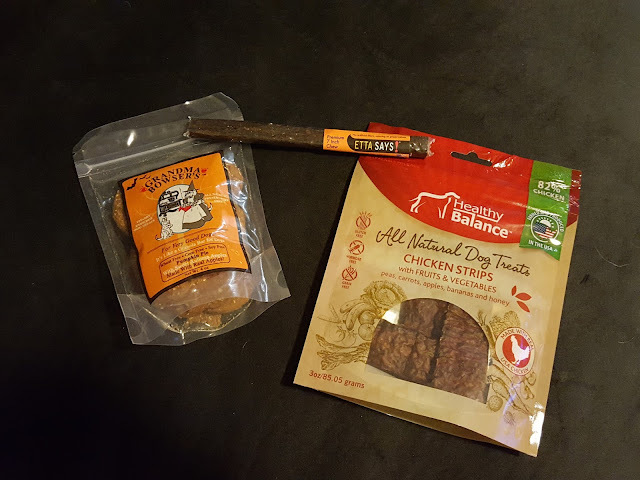 Healthy Balance Chicken Strips (3oz value: $8) - The furballs will never turn down a treat (I mean never) but they do have their favorites and so far smoked jerky tops that list. I don't think this one is smoked - in fact I think it might be on the sweet side with honey and lots of fruits and veggies in it - so I'm not sure if this will be a favorite. But one thing's for sure - it'll be gone before Halloween because any type of jerky doesn't last long in my house, whether it's for dogs or humans. Hormone- and grain-free too. Yay! Etta Says Pumpkin Chew (Value: $4) - Is it just me or are the Barkprices for Etta Says sticks getting higher? I could swear it was $3 a few months ago (which I still think is way overinflated for a single crunchy stick). I believe this is the first non-animal protein source we've gotten from Etta Says. Since I only have one of these the better-behaved dog gets it. So far I think Macho is winning because Pebbles just tried to eat his poop when I wasn't looking. Ewwww. Think BarkBox sounds cool? I bet you do ;) Use my referral code DOGSYAY to get a box for as low as $18/month -- plus get a free box tacked on to your subscription just for using the code! Awesomesauce! !